My new office is right across from a Spectrum Athletic Club and the resident manager cut anyone who joins in July a pretty sweet deal. 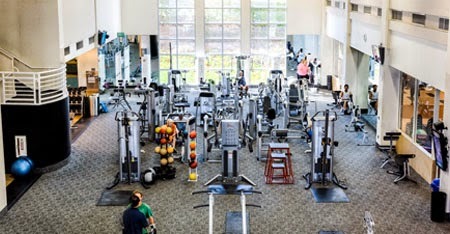 It's a little on the pricey side but it is a nice gym with an 8-lane lap pool, weights, machines, tons of cardio equipment and at least two separate rooms for classes. There's also towel service and full shower amenities as well as a healthy restaurant that serves up breakfast, lunch and smoothie options. I haven't been a gym member since last year so I was raring to get back into the swing of things. Working out at home is well and good but it's nice to change it up every few months. You can push more weight at the gym and I'll be less likely to skip over cardio. Since it's so close to my office I have no excuse not to pop over for a pre-work or lunch time session. When I was in college, the Rowing Machine was a dusty piece of unused equipment. 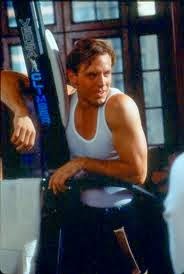 As I checked out other gyms, I'd judge them on their old school-ness if they had either a Rowing or Neck machine. Thanks to the rise of Crossfit and MMA, Rowing is hot again but still no Neck Machine...On top of that, Spectrum has a frigging Versa Climber! You know, what Dolph Lundgren uses in Rocky IV or Michael Biehn in K2?! I hadn't seen one of these since my old hometown gym that I compare all others to since it was a dungeon style, no frills joint with tons of equipment yet well maintained with spray bottles and towels every few feet. Each giant set was repeated 3 times with increasing weight and I was sweating. Seated calf raises, neck extensions and forearms finished up my weight lifting portion then I went and pedaled 3 miles on the bike in about 10 minutes. After a quick shower I grabbed a post workout smoothie consisting of Orange Juice, Isopure Vanilla Protein, a banana and ice. They say fructose is not the kind of sugar you want after working out because it goes to your liver before your bloodstream while dextrose goes right into the system and helps replenish your glycogen or energy stores. But corn sugar wasn't on the menu so I just had to make due. Going to push it hard the next couple of weeks as I've just scheduled a one on one training session with former Mr. Olympia and lifelong inspiration, Frank Zane, at his retreat in San Diego during Comic-Con week!